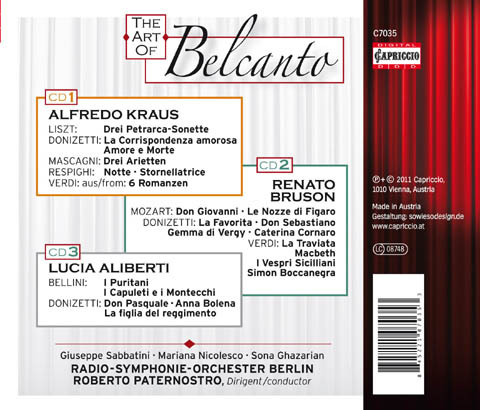 Most famous Recordings of ALFREDO KRAUS, LUCIA ALIBERTI and RENATO BRUSON, with Arias by Bellini, Donizetti, Verdi , Mascagni etc. Also included rare Opera Scenes like Donizetti’s „Gemma di Vergy“, „Don Sebastiano“ or Bellinis „I Capuleti e i Montecchi“. 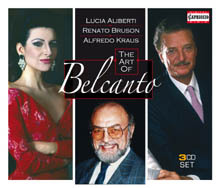 A high recommended 3CD-Album for opera friends and fans of these 3 worldwide known „Belcanto“-Artists.